GOSHEN, Ind. (CNS) — Tears well up unbidden in the eyes of St. John the Evangelist parishioner Ana Bautista as she talks about what it’s like to be a Deferred Action for Childhood Arrivals recipient, or “Dreamer,” in the current uncertain political climate. A gentle person with an engaging smile and strong faith, Bautista, religious education coordinator at the parish, said she prays that the DACA program will continue. 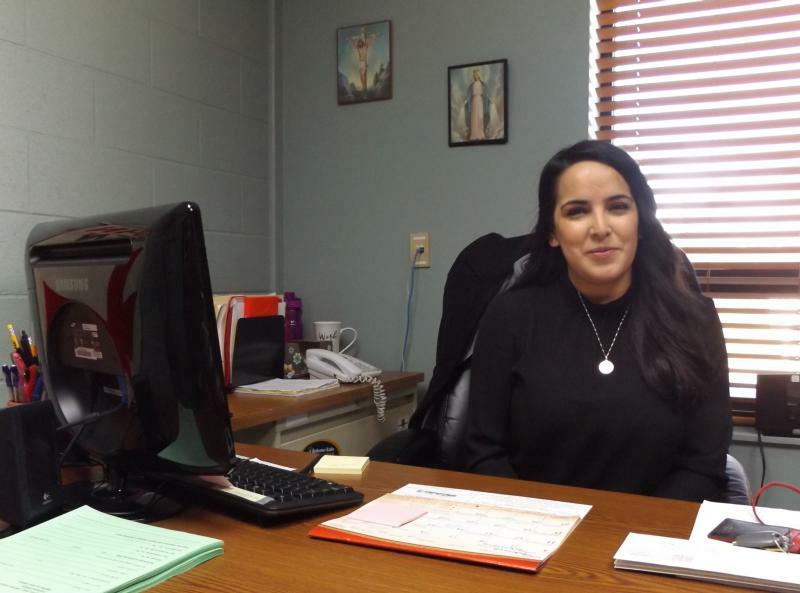 Bautista explained to Today’s Catholic, newspaper of the Diocese of Fort Wayne-South Bend, that her father and older brother immigrated to the U.S. from Mexico in 1999. Two years later, her mother and other brother came, and in 2003 Ana and her three sisters were united with their parents and brothers in Indiana. To qualify for DACA status, an applicant must have been brought to the country before their 16th birthday, lived in the U.S. for five consecutive years, attended school or have a high school diploma, and currently be between 16 and 35 years old. There is a $495 application fee and applicants must undergo a background check. The process must be repeated every two years. If anything comes up in the background check, the DACA status is revoked and the person can be deported. DACA’s future is uncertain. President Donald Trump in September announced the end of the program for about 800,000 young adults living in the U.S. who were brought into the country without legal permission as children. He called on Congress to find a legislative fix, but no action has yet been taken. Two federal judges this year blocked the administration’s efforts to end DACA, ruling the government must continue to accept renewal applications. The U.S. Supreme Court has declined to hear appeals in the cases, leaving the rulings in place. The high court said the Trump administration must follow the usual appeals process through the lower courts. A third federal judge has ruled in Trump’s favor, saying that ending DACA is not unlawful. Bautista is under the impression that DACA also was supposed to be a path to citizenship, but she doesn’t think there is any clear plan for that today. President Barack Obama created the program by executive order. She said there are plenty of misconceptions about what DACA status means. “Most people think if we have DACA, we can get welfare. That’s not true,” she said. What it does allow is for recipients to get a work permit and a Social Security card, so that they can then obtain a valid driver’s license. “And in the corner of the license it says ‘temporary,'” she noted. Getting DACA status and a work permit allows young immigrants to find a better job. In Bautista’s case, she’s working for her parish. “They don’t realize that it can take five to 10 years or more to get through the process,” she said. Bautista’s mother has been working on obtaining a visa for 10 years. While some of her relatives have become citizens, it may take another five years for her mother’s citizenship to be processed because of a backlog in the Department of Citizenship and Immigration Services. “I’ve been here 16 years, more than half of my life,” Bautista said. But in many ways Bautista feels like she doesn’t really belong in either place — the U.S. or Mexico. She said when she first obtained her DACA status she had the opportunity to return to her birthplace to do some social work. That’s when she came to a defining realization. “I was excited at first, but after two weeks I was ready to come home, what I feel is my home,” she said. Bautista is the only one in her immediate family who qualified for DACA. But she has cousins and friends who are DACA recipients, too. As things now stand, however, life is uncertain for Bautista. “It’s real scary. Imagine not knowing what’s going on. Today you have DACA, tomorrow you don’t anymore, and you’ll be going back into the shadows again,” she said. Bautista must reapply to the program in 2019 — if it still exists by that time. It’s not only frightening for the Dreamers but everyone around them. She has also noticed an air of increasing anger and mistrust toward her and others in the Hispanic community. There always has been some, she said, but it has worsened because of statements made about people of Mexican descent. “I see the look in people’s eyes sometimes when I say I was born in Mexico or that I’m DACA,” she said. Fedorow writes for Today’s Catholic, newspaper of the Diocese of Fort Wayne-South Bend.